Every teenager needs an anthem. Every teenage summer needs a soundtrack. Every generation looks for a trusted leader of the parade that is LIFE; someone to look to for all things style and substance. From the first sound of percussive can't-sit-still rock-infused pop on Say It you get the sense that you might have just found the first official "next big thing" for 2007. 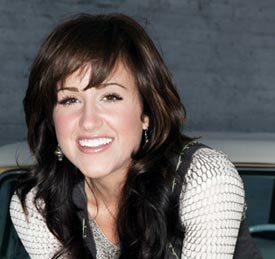 Tracks like "Set the World on Fire" and "You" certainly feel anthemic and once you see newcomer Britt Nicole's heart for the youth of this generation it all starts to click. You may have just stumbled across all three. With such noted producers at the helm as Tedd T. and Double Dutch, Britt's Sparrow Records debut is a wonderfully textured effort mingling upbeat pop with pensive ballads. The title track, which Britt penned with Cindy Morgan, Jason Ingram and Tedd T. is among the young artist's favorites. "We were talking about how as people, we tend to live in the past a lot or in the future," she says. "We rarely live in the NOW and God is in the now. It's about living in the moment. That's really the message of Say It - From now on, every second of every minute, I'm living in it." The youthful and petite brunette speaks to her generation in a language they understand - seamlessly transitioning from drinking chai tea and texting friends to the deep desire to inspire her peers to be consumed with a passion for God and to know Him deeply. "I personally lived the experience of being raised in church all my life and being a part of youth group. I always sang about God, talked about God, read about God, but I knew, I knew, I knew that there was something more," shares Britt, who works with the youth group in her home church when she is not on the road. "I meet a lot of young people who have been in church their whole life and know about God but don't really know Him as their Father and their friend. They see God as so far away and think 'Does he really understand me and does he really know what I'm going through?' My heart is to go into those dry, dry places that need water and fresh fire." This heart for ministry is nothing new for Britt who at a young age was involved in with her grandfather's church and TV ministry, singing with her brother and cousin. Her roots go deep, stemming from a long line of loving, Godly family members which helped to develop her heart to sing and to develop her own unique path. Britt, who started writing songs at 16 and has co-written every song on her upcoming release, has found her own direction for her writing and musical style, which is simply an outpouring of her depth and committed spiritual walk as a young woman who loves God intensely. She doesn't simply sing about issues surrounding today's youth, but Britt shares from personal experiences such as her parents' divorce when she was only seven years old. "Don't Worry Now" is a song that Britt explains actually healed her personally through writing it. "I talk about things (on the record) that I've struggled with, my weaknesses, hurts and own life experiences and just trying to be real," says Britt. "Through God's peace and healing in my own life, I feel that I can speak and sing of these things with genuine conviction and passion for those who are in similar places." We all need a companion and confidant to get through life's peaks and valleys - someone to dance with, to cry with and to just be yourself around. For you it might be a journal, a best friend, that perfect summer soundtrack - or all three. Meet Britt Nicole.